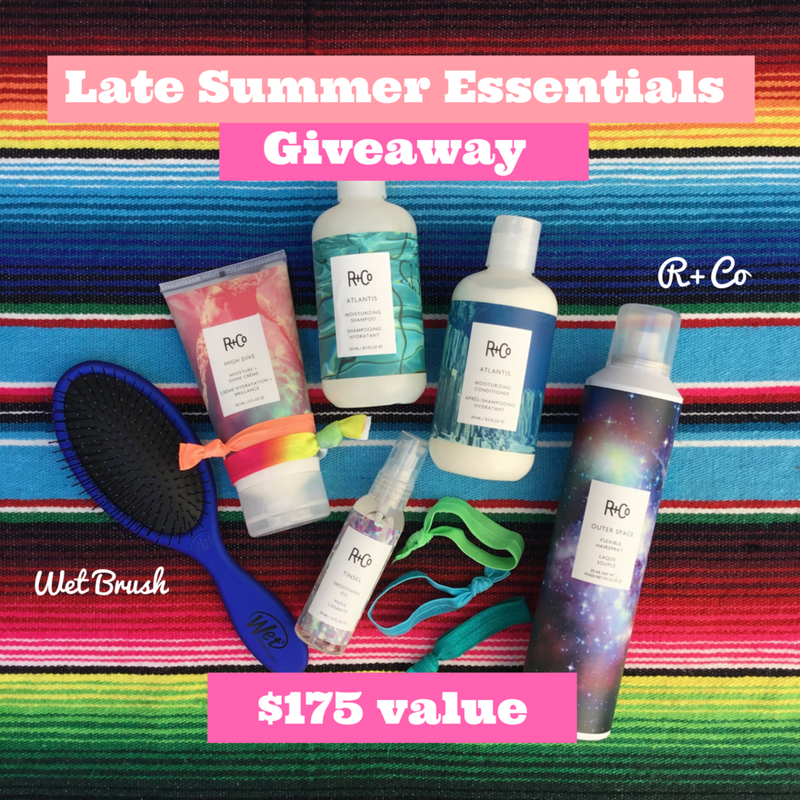 We're giving away some of our favorite R+Co products and one of the best detangling brushes on the market, the Wet Brush! To enter, follow Mockingbird Salon on Instagram, like the giveaway post, and tag three friends in the giveaway post! 1. PROMOTION DESCRIPTION: TheLATE SUMMER ESSENTIALS GIVEAWAY ("Sweepstakes") begins on 8/14/2018 at 12 AM and ends on 8/28/2018 at 12 AM (the \"Promotion Period\"). The sponsor of this Sweepstakes is Mockingbird Salon ("Sponsor"). By participating in the Sweepstakes, each Entrant unconditionally accepts and agrees to comply with and abide by these Official Rules and the decisions of Sponsor, which shall be final and binding in all respects. Sponsor is responsible for the collection, submission or processing of Entries and the overall administration of the Sweepstakes. Entrants should look solely to Sponsor with any questions, comments or problems related to the Sweepstakes. Sponsor may be reached by email at mockingbirdsalon2010@gmail.com during the Promotion Period. 2. ELIGIBILITY: Open to legal residents of THE GREATER PHILADELPHIA AREA who are 18+ (the "Entrant"). Sponsor, and their respective parents, subsidiaries, affiliates, distributors, retailers, sales representatives, advertising and promotion agencies and each of their respective officers, directors and employees (the "Promotion Entities"), are ineligible to enter the Sweepstakes or win a prize. Household Members and Immediate Family Members of such individuals are also not eligible to enter or win. "Household Members" shall mean those people who share the same residence at least three months a year. "Immediate Family Members" shall mean parents, step-parents, legal guardians, children, step-children, siblings, step-siblings, or spouses. This Sweepstakes is subject to all applicable federal, state and local laws and regulations and is void where prohibited or restricted by law. This Sweepstakes is open to legal residents of THE GREATER PHILADELPHIA AREA and Prize will only be awarded to residents within said locations. No delivery, prize must be picked up by the winner. All federal, state and/or local taxes, fees, and surcharges are the sole responsibility of the prize winner. Failure to comply with the Official Rules will result in forfeiture of the prize. 4. HOW TO ENTER: Enter the Sweepstakes during the Promotion Period on Instagram by following @mockingbird_salon and tagging three friends. 6. WINNER NOTIFICATION: Winner will be notified via Instagram approximately ONE DAY after the random drawing. Potential Winner must accept a prize via Instagram as directed by Sponsor within ONE WEEK of notification. Sponsor is not responsible for any delay or failure to receive notification for any reason, including inactive Instagram accounts, technical difficulties associated therewith, or Winner’s failure to adequately monitor any Instagram account. 7. PRIVACY: By entering the Sweepstakes, you grant Sponsor permission to share your Instagram account and any other personally identifiable information with the other Sweepstakes Entities for the purpose of administration and prize fulfillment, including use in a publicly available Winners list.